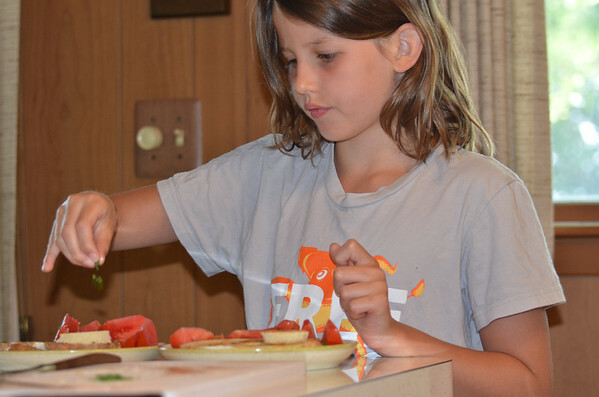 Exploring why The Child eats well: parenting or luck? Never underestimate the power of the sprinkle. No. I don’t mean the colored candy kind. Although if they are chocolate, and called Jimmies, I can’t quite resist those either… but that’s another post. What I mean to say is, sprinkle, as in sprinkling seasoning. Part of getting a kid to try different food is engaging them in preparation. Something as simple as seasoning is enough to make a kid proud of cooking. She pops out of whatever she was doing, grabs a pinch of salt or a shaker of spice, and holds it up high. Sometimes there is a quick dramatic flourish, and she’s gone in a flash. Other times it is a focused and slow shower of flavor, watching carefully to see where the individual grains land. Fresh cut chives sprinkled on breakfast eggs and tomatoes. In various episodes he points out why he holds his hand so high when seasoning. Hold it low and all your salt lands in the same place. Yuck! Hold it high and you get a wide dispersal area. Any kid who has played with glitter knows this. The light went on, and since she was always strapped into her chair at the counter when we cooked anyway, we let her start seasoning things as a young toddler. A good place to start is roasted fingerling potatoes. The potatoes, simply cut in half on a tray and roasted skin side up, can take a little over-seasoning on their skins as the kid learns even application. I do not know if this will help a kid venture to try something new, we make ours try everything. But it always seemed to help her look forward to sitting down to a meal. Watching someone else partake of what she made tapped into the pride as well. The first cookbook I ever bought for myself was Jacques Pépin’s Cooking With Claudine, and the first recipe is for a steak with roasted potatoes and onions. He roasted large potatoes, and my preparation has evolved over many years to use fingerling potatoes instead. Roast just a few for a small dinner, or prep a whole bag for a party. We have them alongside everything from salads to stews to steak, or even dipped into chili or salsa. Preheat oven to 400 deg. Slice potatoes in half, selecting those which are roughly the same size. Prep a half-sheet pan by pouring some olive oil in the center of the pan. Use a silicone baking sheet if you have one, but it is not necessary. Having a quality half-sheet pan that heats evenly is far more important. Plunk a potato, cut side down into the puddle of olive oil and slide it over toward a corner of the pan, leaving some space around it for air circulation. In succession plunk and slide each potato. Then comes the seasoning. With kosher salt from a ramekin, The Child takes a pinch and holds it high to sprinkle. The pepper grinder is so much fun The Child loves that too. BUT, there is the necessary admonishment here… you season it, you eat it. There is no getting carried away with the pepper grinder and throwing food away. That’s a mistake a kid makes only once. Roast the potatoes for anywhere from 20-45 minutes depending on your oven, size of potatoes and preferred doneness. Once you can easily stick a knife in them from the top, they are done. Let cool enough to handle and serve hot. Leftovers are easily nuked.